They are in the western, central and eastern counties (parishes). They are superb cultural, historical and scenic attractions in every way. (Most people are completely unaware how remarkable they are). They were the first substantial buildings erected in Bermuda, all built by Britain. See a basic listing of the British forces that built and occupied them at various times in British Army Units in Bermuda, 1776-1953. Captain Minor Knowlton was no stranger to Bermuda when he was sent to look at its defences by General J.G.Totten, Chief Engineer, US Army. In 1842, he had come here for his health, as he suffered from epilepsy. This did not deter him from a spying mission to Canada, where he examined Fort York at Toronto two years prior. His policy in Bermuda was "to form few acquaintances and to avoid entertainments altogether." He gave the impression that his walkabouts, even up to the fortifications, were to improve his health. Customs officers, however, must have wondered why his luggage on departure contained "two blocks of shell limestone, each a little more than one foot cube, which I brought from Bermuda as specimens of the type of stone used in the fortifications of those islands. It is a soft kind of shell sandstone which may be advantageously shattered by hollow shot." Upon his return in June 1849 to New York after three months in Bermuda, Knowlton wrote to Totten promising a full report, of which there is no trace. What has survived is an original plan of the Dockyard by George Taylor, Survey of Buildings to the Navy Board in London, which Knowlton must have obtained by paying someone from the dockyard. The last officer, gentleman and spy was Lieut. 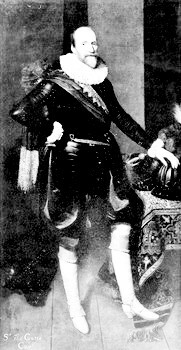 Frederick Prime, who also reported to General Totten at Washington, DC. Having graduated first in his class at West Point in 1849, he found himself at Bermuda three years later. Prime was clearly taken by Bermuda, so much so that he returned to the subject of its invasion while on duty at Fort Alcatraz some years later. In his "Notes on an expedition against the Bermudas", he examines all of the channels, the strength of the garrison and the nature of the fortifications. Prime defines the weakest point as Castle Harbour, which could be entered easily without coming under fire from the major forts on St. George's Island, those on Castle Island being in disrepair. 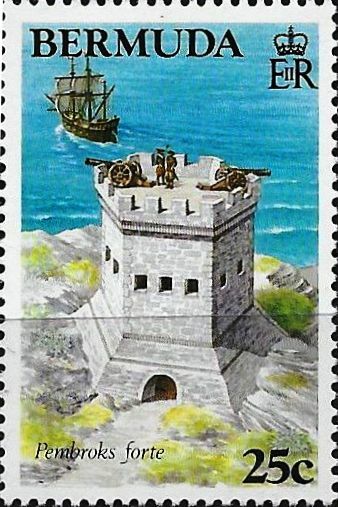 Having reduced the Martello Tower at Ferry Reach, the American invaders could effectively cut off St. George's and its forts from the rest of Bermuda. By taking St. George's from the rear, the subjugation of the rest of the island would soon follow, as the enemy would control the Narrows Channel, the only sea access to the dockyard and Hamilton, a blockade from the land as it were. The most remarkable piece of this espionage is Prime's sketch of the major Bermuda forts in 1852, reproduced here from the National Archives in Washington, DC. These little fort maps are remarkable for their detail, considering that the forts were "visited but once and sometimes under such circumstances that nothing would be committed to paper for many hours after". This detail is important as all of the major forts of the 1820s-1860s were heavily altered in the 1870s and some again in the 1890s. All Bermuda Forts are managed and administered by the Bermuda Government's Department of Parks, Ministry of the Environment, Botanical Gardens, 169 South Road Paget, DV 04, P.O. Box HM 20, Hamilton HM AX, Bermuda. Tel: 441- 236 - 4201. Fax: 441 – 236 - 3711. 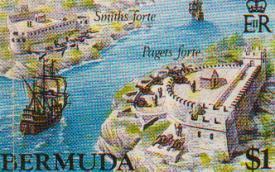 Only Bermuda's remaining eastern forts are shown in this particular photograph. Some - like the one on Hen Island, near Smith's Island in St. George's Harbor - no longer exist. 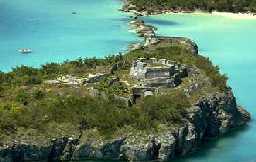 Others off Bermuda's Main Island - on small but once strategic islands - deteriorated into inaccessible ruins. The Martello fort is the only one in Bermuda and was built after the one on Barbuda in the Caribbean (900 miles to the southwest of Bermuda) as an exact copy of one in England. All the forts not on the main islands are accessible only by those who made arrangements with the Bermuda Government to see them by boat. What makes them accessible to the general public is the fact that these Eastern (but not Western) Bermuda British Army-built forts are specifically included in the Town of St. George, Bermuda UNESCO accreditation as a World Heritage site and must there be made accessible to the general public, not inaccessible. 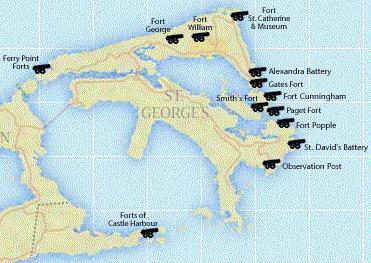 Later on in this file, see a list of all remaining forts throughout Bermuda. They were built in stone when in the rest of British North America at the time, Spanish territories and French possessions, forts were wooden. Only in Britain itself were they also built of stone. Britain had them hundreds of years before Bermuda and the rest of North America were explored. Lack of scrap industries in Bermuda and being far away from world and regional wars meant that while fortifications, carriages, guns and other materials got melted down elsewhere for re-cycled use during various wars, those in Bermuda stayed and became artifacts of exceptional military interest. Good examples are the rifle muzzle loaded guns still on their original carriages and platforms at various local forts. There are 24 left from more than 80 once here. They were built over three and a quarter centuries. All had their own supporting buildings, homes and other structures. The most feared enemies were first Spain, then France, then the United States of America (1781 to late 19th century), then France again and Germany during World Wars 1 & 2. 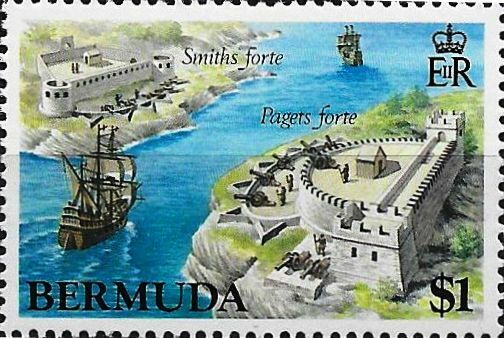 Fortifying Bermuda against enemies was a deliberate British policy from the earliest days. Bermuda even hosted an impressive array of talented British artists, sent by the British Army or Royal Navy for compilation of detailed military records. Other military personnel refined their talents in leisure times. They painted landscapes and seascapes showing how Bermuda developed as a naval base and land fortress bristling with heavy guns that could heave first cannonballs then shells miles out to sea. The process continued throughout most of the 19th century, until the huge Royal Naval Dockyard in Bermuda and its protective ring of British Army manned coastal forts, were completed. During this period, when the USA and Great Britain were not the firm allies they are now, many areas of Bermuda were denuded of foliage and developed into military fortifications. Military artists sent to paint these changes included Thomas Driver, E.G. Hallewell and Gaspar Le Merchant Tupper. Some of their works are in art galleries though out Bermuda. Others are in historical records in Bermuda and overseas. Bermuda was important to the British Government for centuries and, much later, to its allies as well in World Wars 1 and 2. Because they're in easy to find and in picturesque areas, you don't have to be a history buff to enjoy the forts. Most have been restored. Some are in parks. All have gorgeous views. From 1808 to the 20th century, Bermuda was the principal Royal Navy command station for North America's Great Lakes, Caribbean and South Atlantic to St. Helena and the Falkland Islands. This is not well known. In fact, right up until the early 1900's - again from the British start of World War 2 in September 1939 until 1945 and then in the Cold War - it had a supremely important strategic position. A former fortified area of four acres, off Point Shares, in central Pembroke Parish. Historically important. Unfortunately, with no public access. It can be seen from the Fairylands shoreline. 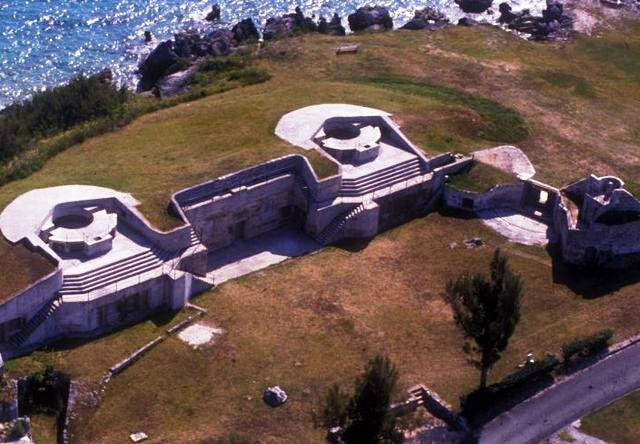 The British Army built Bermuda's largest gunpowder magazine on it in 1870, so it also qualifies as a fort. Then it was abandoned as such, for Bermuda's first aquarium built here in the 1920's, forerunner to the Bermuda Aquarium, Natural History Museum and Zoo in Hamilton Parish. Privately owned, the island now has guest houses, a swimming pool, tennis and squash courts and docks and cannot in any way still be described accurately as a fort. Nor is it accessible by the general public. Princess Alexandra, after whom the fortification was named. An eastern fort. A cannon-shot from Gate's Fort or Fort St. Catherine, it was erected on the site of Buildings Bay Battery, a work probably of the 1840s of which little is known. It is named after a Princess of Denmark who later became the young wife of Edward, a son of Queen Victoria and Prince Albert, later to be Edward VII, King of Great Britain and Emperor of India. Alexandra Caroline Marie Charlotte Louise Julia was the daughter of King Christian IX of Denmark and married Edward at the age of 17 in March 1863, Alexandra Battery at Bermuda being built a few years later. During her long marriage to the Prince of Wales and later king, Alexandra put up with Edward's continued association with other women. 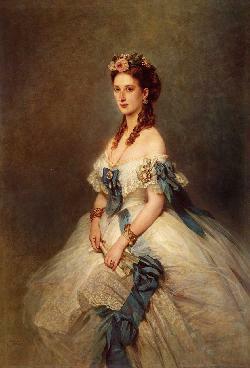 Alexandra was immensely popular with the population of Britain at large right into 1925, the year of her death. 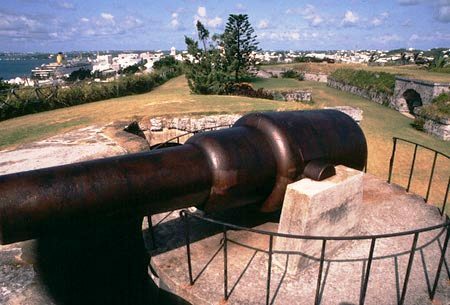 The Princess's battery was built for a new type of gun, the Rifled Muzzle Loader, of which one is at the site, and its gun ports were unique in Bermuda, being made in wrought iron in the "Gibraltar Shield" pattern. 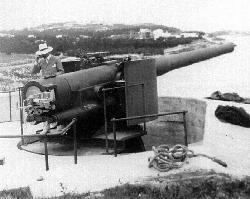 At the beginning of the 1900s, when Alexandra became Queen, the battery was modernized, together with other Bermuda forts and armed with two 6-inch Rifled Breech Loaders, being in turn the latest type of weaponry for coastal fortifications. It was last manned as a gun battery in World Wars 1 and 2. It had a new lease of life in 1998, with its interior once again opened to the public. St. George's Parish, in Ferry Point Park. Not accessible to the general public despite being classified with the nearby Town of St. George as a World Heritage site. Castle Island was originally known as King's Island, 3.5 acres, in Castle Harbor. It is one of the "Castle Group" of islands, mother lodes of original British colonial history. It has the historically important King's Castle stone fortification, dating back to 1612. 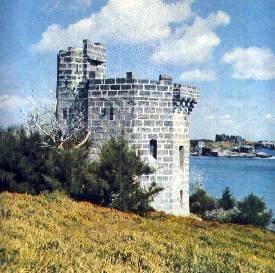 It was built by Governor Richard Moore, as the oldest standing English fortification in the New World and oldest standing stone building in Bermuda. It contains the Captain's House, built in 1621, the oldest standing home of Bermuda stone and the oldest standing English house in the entire Americas. Archaeological excavations are almost continuous. Recently, a King George III half penny was found there, dated 1775, legal tender in Bermuda during the American Revolutionary War, and 15 pieces of rare Bermuda Hogge Money dating back to 1615. The historic buildings are overlooked on the summit by Devonshire Redoubt, built in stone in 1621 to replace one destroyed by fire in 1619. 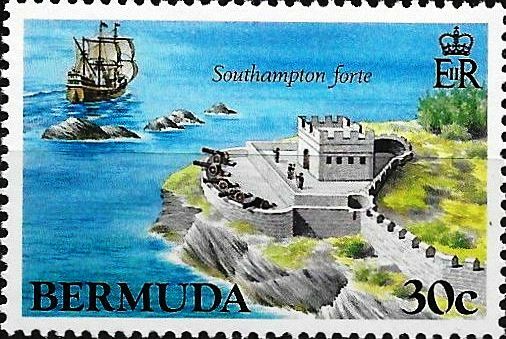 It was from the King's Castle fort that the only attack ever recorded by the Spanish against Bermuda was repulsed in 1614. Two shots were fired from the fort at the two Spanish ships sighted just outside the channel into Castle Harbor. The invaders headed out to sea without knowing the fort had only one more cannonball left. The fort was improved over the centuries and even saw active duty in World War II. 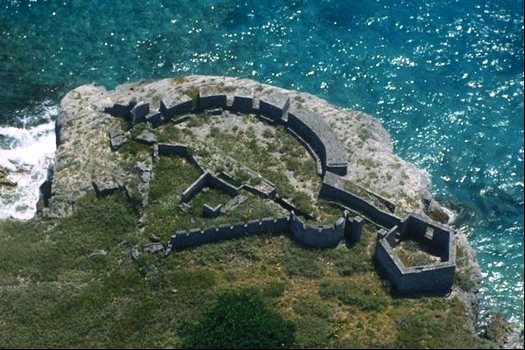 Charles' (Old Castle), 3.5 acres, is another in the "Castle Islands" group of prime historical importance for its original fortification. 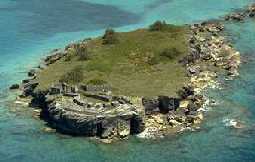 The ancient English forts on these Castle Islands began the coastal defense system of the overseas British Empire. Opposite Castle Island is Brangman's Island, originally known as Moore's Island and Southampton Island, where historic Southampton fort is located, built in 1612. Southampton Fort (see below)- not to be confused with the parish further west of the same name - was begun in 1620 by Governor Nathaniel Butler from a platform and five guns he raised from the wreck of the ship "Warwick." Southampton Fort on Brangman's Island, completed in 1621, part of the Castle group shown above. Central, in Devonshire Parish. A place for sightseeing, swimming, fortified history and parklands, off Devonshire Bay Road. This is one of the survivors of what were once many coastal batteries stretching the entire length of Bermuda. Stay to the left until the road ends and the park begins. An eastern fort, on the North Shore in St. George's Parish. The remains of a Martello Tower and some once extensive British military works at Burnt Point Fort can still be seen, but they have been neglected badly. Retreat Hill. Built 1837-1840. Near the Town of St. George. An eastern fort in St. George's Parish. A product of the major refortification of Bermuda that began with the establishment of the Dockyard at the West End in 1809. In his review of island defences in 1828, the Duke of Wellington, then Master General of Fortifications, noted that the "objects are to direct the fire from Seven heavy Guns on Traversing Platforms to be mounted on two of its sides upon the Ship Channel to command the Southern approaches to Fort St. Catherine and to afford collateral assistance to the other Works of the position". (The position was that of Retreat Hill centered on Fort Victoria). Named after Queen Victoria's husband, Prince Albert, it is a pentagonal moated redoubt completed in early 1842 and has a small interior keep. It was described in some detail in 1842 to the American Government by the American spy Albert Fitz sent to make a special report on the British Army's and Royal Navy's weaknesses in Bermuda. It is one of several carved from solid limestone rock at huge British Army expense into Retreat Hill. It commanded the channel along the eastern coast of St. George's Island. It was positioned to bring guns to bear on enemy vessels trying to head for the Dockyard. In 1852 the only plan record that survives of the first phase of Fort Albert is preserved in a sketch of the forts at Bermuda made that year by Lieut. Frederick Prime, an American spy. The drawing shows that the fort was constructed to the Duke of Wellington's specifications, but in addition, it had two eight-inch howitzers and two ten-inch mortars, thus incorporating the three types of artillery of the day, the cannon (for low level and long-range), the howitzer (for higher level, shorter range) and the mortar (for high level, short range, for "plunging fire" again the unprotected decks of ships). The fort was constructed of Bermuda stone, with some details in the harder limestone, probably carved at the dockyard, and had a deep ditch with reverse fires and a "Keep" for housing the officers and gunners. In 1865, Fort Albert was modernized for four ten-inch Rifled Muzzle Loaders by the British Army. It used to be accessible - until the infamous building in the 1960s/1970s of the Lowe's Inn (later Holiday Inn, later Club Med, later abandoned) hotel, until the hotel's destruction in mid 2008 to make way for a new hotel by 2012. In 1877, at Fort Albert (expanded in 1860) in St. George's, a huge fire occurred. With much gunpowder stored there, all St. George's was threatened. Heroic efforts by men of the Royal Artillery and 87th Royal Irish Fusiliers stemmed the fire. Perhaps this old fort will once again be open to the general public. In Tucker's Town at what is now Frick's Point, this small oval redoubt of a fort guarded Castle Island from a flanking attack launched by enemy forces from the Main Island. It commanded the narrow peninsular of Tucker's Town and the land ward approach to King's Castle. It was built during the American Revolution, probably during the brief tenure of Lieutenant Governor George Bruere, one of the sons of Governor Bruere. He succeeded his father who never fully recovered from both the shock of the theft of gunpowder from Bermuda in 1775 and that his other son, fighting in the British Army against the Americans at the Battle of Bunker Hill, died from wounds inflicted by that gunpowder. Not accessible to the general public despite being classified with the nearby Town of St. George as a World Heritage site. This island on which Fort Cunningham (above) is situated is on the northern side of the original ship channel into St. George's Harbour. It is 36.26 acres in size and was defended from 1612 until the end of the First World War. Richard Moore, sent out from England as first Governor of Bermuda in 1612, decided it was the most important place to be defended. He had platforms for guns cut on the southeastern end of the island as this overlooked the entrance to the channel. This appears to be below the present site of the fort). 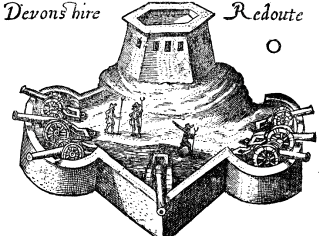 Governor Daniel Tucker succeeded Moore in 1616 and ensured the construction of another battery below and in front of the original semi-circular platform. In 1619, the third Governor, Butler, built a new platform. These first forts - Paget and nearby Smith's - were all near the ocean. (Although periodic repairs were attempted during the next century, none lasted. When Colonel John Bruce Hope became Governor in 1722, major work was done on Paget Fort (or Queen's Fort as it was sometimes called). The rocks on which the lower battery stood were probably undermined by constant pounding of the waves, particularly in winter. It took several years to complete the repairs on both Paget and nearby Smith's Forts, at great cost. In about 1740, Governor Alured Popple put all the fortifications in order and arranged to have 10 guns mounted at Paget Fort. In 1746, so many prisoners-of-war were brought in by Bermudian privateers that the only place available to accommodate them was Paget Fort. They were guarded by troops and had a food allowance of one shilling a day. In 1788, Major Andrew Durnford from England re-built Paget Fort. But a violent gale in 1791, which lasted for several days, destroyed the work. 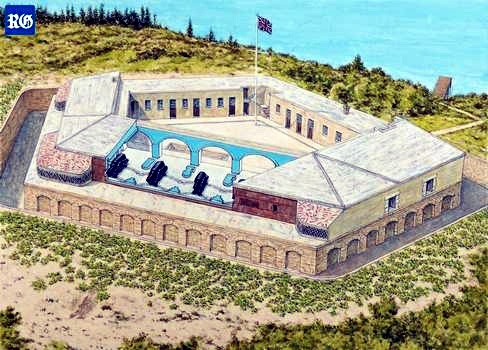 In 1793, with the threat of war with France, the Governor of Bermuda directed Durnford to build a new Barbette Battery on the height of the land above Paget Fort on Paget Island. The moat and lower masonry of the fort were reconstructed in 1823. In 1875, Fort Cunningham replaced the older Paget Island Fort. It took its name from a Captain Thomas Cunningham of the Royal Engineers, who supervised its new construction. The upper part was removed for a state of the art iron skin fort - with two iron fronts instead of masonry walls. Known originally as Gibraltar shields, only in Bermuda were they made into continuous straight walls, one for five guns and one for two. Seven huge guns for the shields were found in archaeological excavations in 1991, two of only six known examples to have survived anywhere of the British Army 38 ton, 12.5 inch caliber Rifled Muzzle Loader guns of the 1880's. 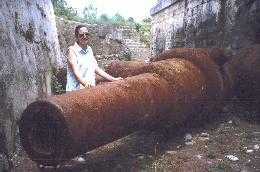 The fort and its massive guns have been allowed to deteriorate badly. 2018. March 31. Opinion. By Dr Edward Harris, founding executive director emeritus of the National Museum of Bermuda. "In recent pages of The Royal Gazette, the Mirrors charity announced another field day at Paget Island, St George’s Parish, with the intention of continuing the restoration of the magnificent and unique Fort Cunningham, much neglected for the past 25 years since archaeological work in the early 1990s. The fort is one of the military sites of Bermuda’s World Heritage Site, so designated by Unesco, among only 800 others worldwide, so that the Mirrors group is to be commended for their initiative in undertaking work normally the responsibility of the Government. As noted in the newspaper, Kimberley Jackson, programme manager for Mirrors, said: “We have started discussions with the St George’s Foundation and are looking forward to expanding the partnership for restoring the fort. It makes sense to have all the key partners at the table to develop the long-term restoration plan.” Michael Weeks, the Minister of Social Development and Sport, stated that the proposed April 7 event was “a great opportunity to simultaneously support the preservation of Bermuda’s heritage and culture and also learn about the incredible history of this historic site. It’s a great event for families to connect and also for young people to gain community service hours”. The project is being sponsored or assisted by XL Catlin Bermuda, Outward Bound, the National Trust, the National Museum, Keep Bermuda Beautiful and the Government’s Departments of Parks, and Youth, Sports and Recreation. The job is very large and all are to be congratulated, especially the Mirrors group, for the coming efforts to save one of Bermuda’s finest military monuments and the potential outstanding park that is Paget Island. The philistines among us will doubtless complain about the project, failing to understand the value to our essential tourism economy of such monuments, which, being unique, are one of the main reasons why the discerning visitor wishes to visit Bermuda or any other destination with cultural and heritage treasures. Most such visitors stay in land-based accommodation, which remains the foundation of the tourism economy, despite the numbers of arrivals by sea. It is the discerning hotel and guesthouse visitor that has the spending power to continue to fund our lifestyle, as they have done for over a century. Included in such visitors are the British and United States military that, up until the end of the Cold War in 1995, pumped billions into Bermuda, leaving behind monuments like Fort Cunningham that now allow us to make even more money off the military by exploiting such sites for the cultural tourism trade. 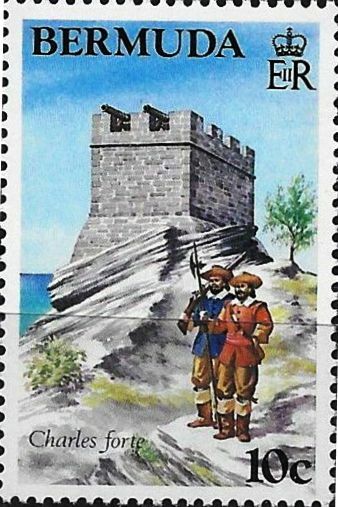 In that regard, the publication of a new booklet, Defenses of Bermuda 1612–1995, is to be welcomed as it is a comprehensive but inexpensive summary of the wonders of Bermuda’s military history. The booklet would not have happened without the passion that American Terry McGovern and his family have had for Bermuda over a generation. Terry was heartened to hear during the recent launch of the volume that the Mirrors group had formed a battalion of volunteers to assault the invasion of Fort Cunningham, and indeed Paget Island, by invasive and destructive trees. So as the old mariner would say at the start of a long voyage: “Godspeed and following seas” — in this case to Mirrors and everyone who is willing to do their bit to preserve an important aspect of the long and honorable (and vitally economic) military history of this stationary aircraft carrier, as it once was for a period." An eastern fort, on the North Shore in St. George's Parish, one of the many fortifications that ringed and protected the Town of St. George. Originally erected in 1612 to 1613 by Governor Moore as a single tower called Riches Mount, the fort recalls a bygone era of colonial militarism. In 1788, it was re-named Fort George after King George III in British defiance of the US War of Independence, and re-built. The present structure, which replaced the earlier redoubt by Andrew Durnford on the side of The Mount, dates partly back to 1788 and partly to the 1840's. This particular redoubt was built in the shape of an eight pointed star surrounded by an inner keep reached by drawbridges spanning a dry moat. Once manned night and day to keep away Britain's enemies, it even had an escape tunnel 150 feet long. The fort and its water catch are surrounded by cast iron fencing posts topped with a wired on crown or finial. The steep walk rewards visitors with a breath-taking view of the town and many islands of St. George's Harbor all the way over to St. David's Island. 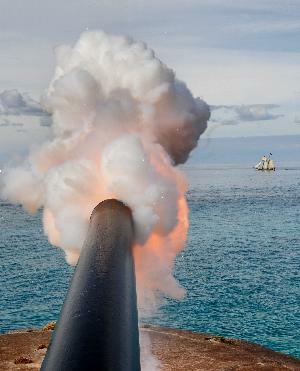 A 25 ton, 11 inch Rifled Muzzle Loader cannon is still aimed at cruise ships docked in the town of St. George. Today, the fort serves an important civilian purpose. It is the headquarters of the Bermuda Maritime Operations Centre, owned and operated by the Bermuda Government under the Department of Marine & Ports Services. Several key functions are provided in support of the local and international maritime community. These include the role of Rescue Co-ordination Centre (RCC), Vessel Traffic Surveillance (VTS) and the all important communication functions associated with a Coast Radio Station (CRS). The Bermuda Maritime Operations Centre maintains a 24 hour distress watch on the international distress frequencies of 2182 kHz, 4125kHz and VHF Channel 16 as well as the Global Maritime Distress and Safety System (GMDSS) Digital Selective Call (DSC) distress frequencies of 2187.5 kHz and VHF Channel 70. NAVTEX broadcasts are also undertaken on frequency 518 kHz with NAVTEX messages typically being received out to at least 300 miles of Bermuda. Notices to Mariners, Local Navigational Warnings, Atlantic and Bermuda marine weather forecasts are all broadcast around the clock according to an internationally published schedule. The service employs Radio Officers and RCC Controllers with their duties including watch keeping duties on a shift basis. 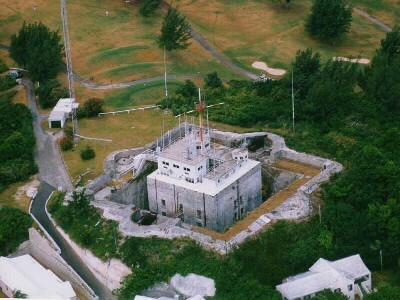 On top of the keep is the Rescue Coordination Center (RCC) of Bermuda Harbor Radio, two specialty organizations. The Center has three main divisions in the area of ocean traffic: Rescue; Vessel Traffic Survey (VTS); and Harbor Radio, a Bermuda Government operated communication facility. Via the RCC, it provides a marine search and rescue service, vessel traffic services in the waters of Bermuda, a listening watch on marine distress frequencies, and marine communications services as required. It is microwave linked to a radar surveillance system on Gibb's Hill Lighthouse in Southampton Parish for all signals. RCC Bermuda forms an integral part of a network of rescue centres around the world. Participation in an Inmarsat satellite alerting system called SARNet gives RCC's in Canada, Denmark, Greece, Norway, Spain, Finland and the United Kingdom the ability to broadcast information of common interest quickly and reliably. RCC Bermuda is the COSPAS-SARSAT Search and Rescue Point of Contact for Bermuda registered EPIRB or ELT alerts and with Bermuda registered ships and aircraft operating world-wide, SAR missions require a global outlook. While the Bermuda Maritime Operations Centre (MOC) holds responsibility for the co-ordination of Search and Rescue (SAR) around the island generally, normally a rescue effort out to 30 miles from shore is all that can be undertaken on a consistent basis with the limited resources available locally. However in all SAR cases, best use of all available resources is essential and this typically will also lead to merchant vessels in transit through the Bermuda area being located and asked to divert to an incident position and U.S. Coast Guard aircraft support may also be requested. Through international maritime and aeronautical SAR agreements the United States holds ultimate responsibility for search and rescue in the Western Atlantic and Bermuda's geographic position mid-Atlantic lends itself nicely to the staging of rescue missions many hundreds of miles into the Atlantic. Search and Rescue services in Bermuda are provided through the combined efforts of a number of Bermuda Government agencies. These include the Department of Marine and Ports Services, the Bermuda Police Marine Section and the Department of Agriculture and Fisheries. A variety of vessels suitable for work in both the shallow reef areas or the oceanic environment can be tasked as the need arises. Not accessible to the general public despite being classified with the nearby Town of St. George as a World Heritage site. An eastern ruined fort, on the eastern side of St. David's Island, facing Castle Harbor in St. George's Parish, it was named after Governor Alured Popple. It was built in about 1737. He filled seven of the fort's nine gun ports by taking cannon from Smith's Fort. It was designed to prevent the enemy from landing on St. David's and launching attacks on Smith's Fort, Southampton Fort and the town of St. George. It was made obsolete by the construction of Fort Cunningham. 2016. November 12. Today marks a special occasion for one of the East End’s greatest landmarks, Fort St Catherine. Usually open on weekdays only, the fort is taking visitors from 10am. 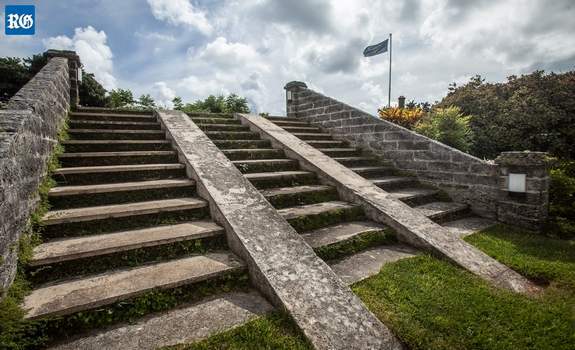 The iconic fortification in St George’s, which was first established in the early years of Bermuda’s settlement, is having a Saturday opening after numerous expressions of interest. Francine Trott, the heritage officer for the Department of Parks, said the exception had been made for today to allow so that children who would ordinarily be in school, as well as adults with work commitments, to explore the island’s history. “We are happy to offer this chance to learn about fortification and how Fort St Catherine played a role in the island’s defence. It’s an interesting activity for any family or for history lovers, and a chance for locals to know your history.” There will be two tour guides for parties of more than five, or visitors can take a self-guided tour. The cost is $7 for adults, $5 for seniors aged 65 and over and $3 for children. The edifice will be open until 5pm. The first stone fort on the site was built in 1614, only a few years after the island was claimed by the Crown, and has been rebuilt several times over the past 400 years. It is part of the Unesco World Heritage site of St George’s. Fort St Catherine’s present-day form was constructed during the 19th century, and stayed in use until 1900. It was turned into a tourist attraction in the 1950s and once featured a production of Macbeth, starring Charlton Heston. The building offers a classic showcase of British forts, complete with guns. An eastern fort in St. George's Parish, the biggest of all Bermuda's many historic forts, easily one of Bermuda's most spectacular attractions. 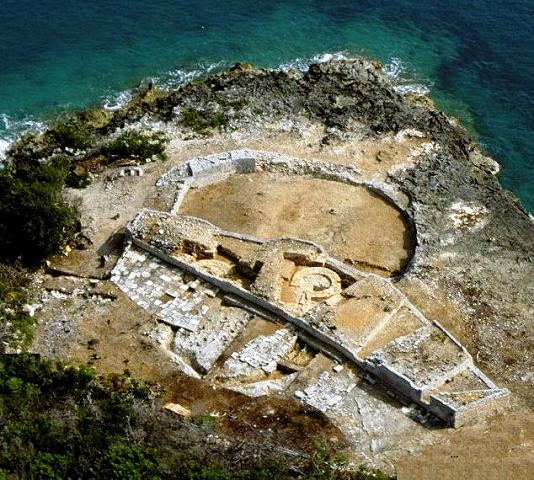 It was one of early Bermuda's fortifications against the Spanish, French - and, much later, the Americans. The coastal and inland views from here are awesome. The fort, overlooking the beach where Bermuda's first involuntary settlers came ashore from the shipwrecked Sea Venture flagship in 1609, is nearly two miles north east of the town of St. George. 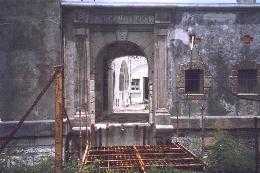 It is the fort principal structure in Bermuda under the management of the Bermuda Government's Curator of Forts. It is not known after which Saint Catherine the fort was named. The fort dates back to 1614, when first built by Governor Richard Moore to defend Gates Bay where the colonists landed. Nathaniel Butler (Governor 1619-1622) wrote in his memoirs that on the north side of St. George's island is erected upon a rock the small fort of St. Katherine, in guard of a certain sandy bay, being the same whereon the first that ever landed in those parts first set their feet. The second life for Fort St. Catherine began at an unknown date, the only evidence surviving in a survey in the Public Archives Canada and in the 1783 report by Simon Fraser, RA. It appears to have been built to the rear of the original fort, which may have been left as a watchtower. 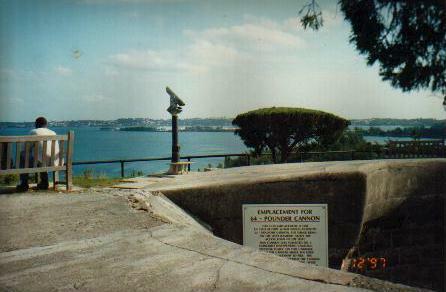 In 1793, Captain Andrew Durnford, a Royal Engineer stationed in Bermuda, strengthened the battery at St. Catherine's Point and built a new battery with a guardhouse on the hill behind the fort. Durnford was a very busy man having sired a second family of six in Bermuda while his wife was at home in Britain with the earlier brood. He built a number of local forts and become the first mayor of St. George's. The present fort dates from 1814. Major Thomas Blanchard replaced the upper battery with a circular fort in the 1820s. Once the Dockyard was started, a number of the forts took on new lives and Catherine was entirely rebuilt on a design by Capt. Thomas Cunningham.. A battery for five guns to the seaward of the Keep was positioned in that fourth life of the fort. 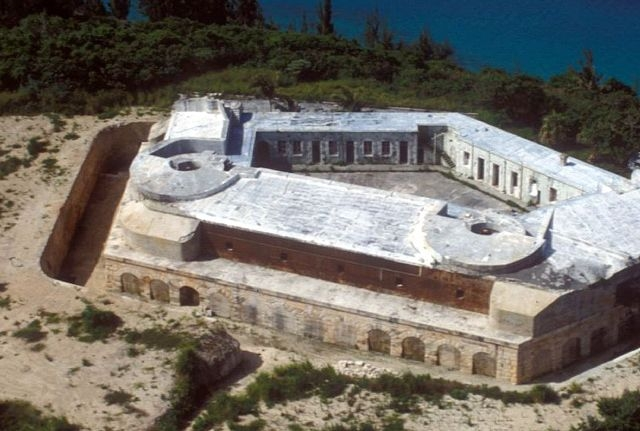 In the 1840s, Governor Reid was distressed to hear that "a mulatto woman, the former cook" of Major Durnford had sold 40 of his Bermuda fort plans to the Americans. Also in the 1840s, Fort St. Catherine was remodeled with the enclosing of the shoreline with a huge rampart that joined the ends of the ditch. This fifth incarnation is seen in the watercolour of 1857 from the Fay and Geoffrey Elliott Collection at the Bermuda Archives. There was a massive reconstruction from 1865 to 1878. It included 25 foot thick concrete embrasures and casemates, so that the fort could be rearmed with five rifled 18 ton muzzle loading cannons. In its sixth life, the fort was rearmed for the last time in the 1870s with Rifled Muzzle Loaders, but the 18-ton guns were tossed over the ramparts in the early 1900s. They could send a 400 pound shell half a mile to pierce 11 inches of solid iron. It was a training ground for local forces and the British Army in the early 1900s. In World War 2, an American magnetic loop was installed at the fort. The present fort is the seventh and last built on the site. It is the first major landmark seen by cruise ship visitors when they first arrive off Bermuda. The main shipping lane is a few cable lengths north. It is how cruise ships and other vessels arrive and depart. It is beyond the reach of Bermuda's public transportation bus system but accessible via a local mini bus or taxi, or rented moped. The fort has cannons, tunnels, ramparts and a drawbridge over a dry moat. Even more armament was added later, to defy an enemy who never came. 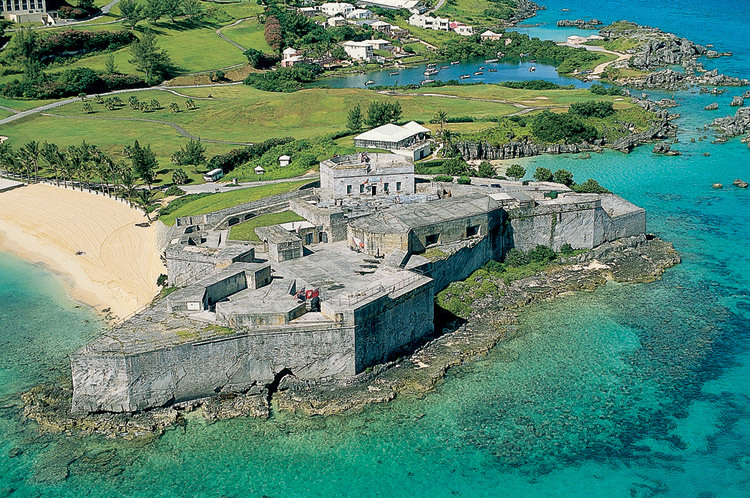 In its heyday, it was the ultimate Bermuda fortress to deter enemies. In its seventh life in the late 1950s, the fort became a "tourist attraction", in an effort by the-then tourism authority, the Trade Development Board (TDB). Guns were brought to the site from Fort Albert, instead of taking the originals out of the sea and off St. Catherine's Beach. Noted American actor the late Charlton Heston was lured to Bermuda by the TDB. starred as Macbeth in a spectacular floodlit production of the Shakespearean play staged on the ramparts. Unhappily, he suffered from a chronic case of road rash after falling from a rented moped while sightseeing before one of his performances. But he didn't cancel - instead, his buttocks and thighs were creamed with a soothing lotion applied by a blushing local lady. In the fort's Old Artillery Store, see the dioramas depicting Bermuda's earliest history. The Powder Magazine, now restored to 19th century war readiness, offers audio exhibits and an antique weapons collection. The Keep has an audio visual show on Bermuda's many other forts and their history, as well as records of the many British regiments that once garrisoned Bermuda. There is a small admittance fee to the fort. To date, in non British flags, only the flag of the State of Maine has been flown, for a specific photo opportunity well publicized in Maine. The Fort is also available for group tours, special events, receptions and corporate functions. The fort re-opened on February 14, 2000 after a five month closure from considerable structural damage caused to below it by sea erosion in a 1999 hurricane. Features include a large video screen in the theater, new mannequins in the exhibition area and George, the resident ghost. Beyond the reach of Bermuda's public transportation bus system, it's accessible if you take the local mini bus or take a taxi, or a rented moped. An eastern fort, above the town of St. George, closed for years, it is almost identical and similar in plan to Fort George. It was built on the site of Warwick Castle by Governor Richard Moore and became known as this. It replaced and enlarged the earlier fort of Warwick Castle from where Bermudians in 1775 with great treachery stole hundreds of barrels of gunpowder from the British in their support of the American Revolution. (Today, elsewhere in Bermuda, American visitors can see the original letter from George Washington asking Bermudians to steal the gunpowder). British soldiers were brought in to stop Bermudian "treachery." The United States and France plotted to capture Bermuda but never followed through. The gunpowder was used by the Americans at the Battle of Bunker Hill. They lost the battle but won the will to keep fighting. The Continental Congress was so grateful that it lifted the embargo on food and grain shipments to Bermuda it had applied to all other British held possessions. Fort William as we know it today was begun in the 1830's but not finished until 1853. Like Fort George, it had a three floor inner keep surrounded by a redoubt. By the time it was completed artillery had advanced so much that it became obsolete. In the late 1880's the fort was converted into a huge gunpowder magazine and the dry moat was roofed over. It created a series of cavernous rooms. They once showed many items of outstanding interest in British colonial forts, plus an array of battle colors, regimental crests, pennants and insignias. In the 1960s and 1970s it was used as a popular restaurant. Sadly, the fort has been closed for years and may never re-open as a fort. This small but historic fort is more of an observation post than a fort. It is a mile due south of Fort St. Catherine along the coastal Cut Road, and the same distance east of the town of St. George. It was constructed between 1612 and 1615 and takes its name from Sir Thomas Gates (see below), Governor elect of Jamestown, Virginia, from 1609. Because he was shipwrecked off Bermuda along with Admiral Sir George Somers and colonists from the flagship "Sea Venture," he governed Bermuda from 1609-1610 before he arrived in Jamestown. (He was not the first Governor of Virginia, was preceded by Edward Wingfield, John Ratcliffe, John Smith, George Percy and possibly others). Its chief attractions today are its stunning views of open sea and its site at the edge of the "Town Cut," the tailor-made narrow channel leading from the open sea into St. George's Harbor. It offers a perfect vantage point and a photographic opportunity for observing at very close quarters large cruise ships, when wind conditions permit, carefully navigating the Town Cut to enter St. George's. It was badly attacked by vandals on October 2001. At the very end of St. David's Island, Bermuda's easternmost point, this is a lovely combined fortification and parklands area of 24 acres. It has superb views of St. George's, St. David's and Castle Harbor. Otherwise known as the St. David's Battery, it was completed in 1910 to defend the Narrows channel going all the way west to the Dockyard, it will certainly interest those with a passion for big guns. It is the finest example of a fort that underwent the transformation from the definition of a fort as a strategic weapon which could be defended from within to the final expression of a fort as a massive long range coastal gun platform. In its heyday, two six inch and two 9.2 inch coastal defense guns were mounted here. They saw around the clock duty, but no hostile action, during World War II, when manned by units of the British Army and what is now the combined Bermuda Regiment. 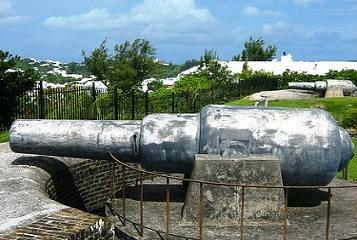 The guns here made the St. David's Battery a fortification with formidable cannon power. Close to the Battery is Great Head National Park, partly overlooking the ocean, magnificent for a picnic and some exploring. From the top of a 90 foot cliff, see Longtail birds as they soar over the ocean and return to nests on the cliff. There's a parking area. 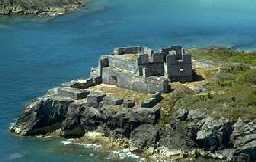 Its old ruined fort was once the dominant feature on this 1 acre island in St. George's Harbor, near St. David's Island, between Peggy's Island and Paget Island. It was named for Governor Moore who in 1612-13 began the fort as a way to command the vulnerable but then strategically important channel nearby. The first cannon was raised from the wreck of the Sea Venture. By the time Moore's term ended, 11 guns were in the fort. This is one of the publicly inaccessible forts. Governor Daniel Tucker spoiled the fort out of military ignorance in 1617 when he deepened the gun platform. Governor Nathanial Butler rectified the problem in 1621. This name and that of the small isle lying off it relate to a shore battery near Wreck Hill first built in the 17th century. The old fort had a strategic position protecting the West End Channel. It was one of the few passages through the dangerous ring of reefs for sailing ships. In 1777, during the American Revolution, British militia soldiers manning the isolated battery had the presence of mind to exchange gunfire with two armed brigs that advanced in a threatening manner although they then flew British colors. The brigs answered with broadsides from their cannon, lowered their Union Jack flags, hoisted the red, white and blue striped ensign of the United States of America and proceeded to invade Bermuda with landing parties. To avoid meeting this much bigger force, the Bermuda based militia men retreated from the battery. The Americans spiked their guns in six days destroyed the walls of the fort. When British troops arrived, the Americans escaped on their ship in what became only the second time in the history of Bermuda that it was invaded. The remains of this can still be seen. See above photo. Built from 1823-1828 by the British Army then in Bermuda, at Ferry Reach, with some help from the 96th Regiment from 1825. It is the Island's only egg-shaped fort and with walls as thick as nine to 11-feet, the fort remained largely resistant to cannon fire. Restored in 2008, including bringing in an "18-pounder" cannon from Fort St. Catherine and creating a cannon mound on top of the building so it would look as it did in the 19th Century. The fort is open from 10 a.m. to 2 p.m. Monday to Friday in the summer and in the winter by appointment only, by calling the Parks Department. This is the only one in Bermuda ever built as part of the unique system of British military fortifications that once was so prominent along the English coast from Kent to Sussex and spawned their own name in British history. Two others were planned but never built as British Army fortifications protecting the old Royal Naval Dockyard against possible French or American attacks. This one was built after the one on the island of Barbuda in the Caribbean, after those in England. Martello towers – also known simply as Martellos – are generally around 40 feet in height and have an unusual rounded shape with thick walls of solid stonework. The round, curved appearance of the Martellos was implemented to enable the garrison of soldiers and officers that inhabited them to have complete 360 degree views. The wide roofs made an ideal stage to hold a cannon, which was placed on a pivot and so also to rotate. The thick, stone walls made the Martello a sturdy platform, and also highly resistant to enemy cannon fire. Some of the Martellos also had a moat around them as a further protection from attack. Often, a single doorway is found 5m off the ground that could only be accessed by a removable ladder. Off the Somerset Road, on Scaur Hill. Bus routes # 7 ("Dockyard") and # 8 stop outside the main entrance. With 22 acres of fortified magnificent views, park land, picnic areas and walking trails. It was built in the 1860's and finished in the 1870's by the British Army's Royal Engineers, when the United Kingdom believed hawkish elements in the USA were conspiring to seize the Royal Naval Dockyard in retaliation for the role British ships played in helping the Confederate forces and using Bermuda as one of their ports. The fort protected the "land front" of the Dockyard from any enemy attack from South Shore beaches. An enormous dry moat was cut right across Somerset Island. Troops invading it from the mainland would have crossed under withering fire from cannons and rifles. 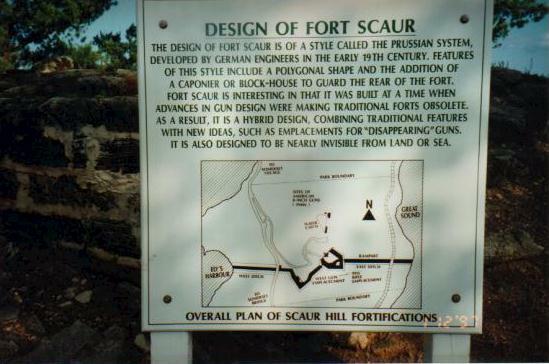 As an inland fort, Fort Scaur had small 64 pound guns on disappearing carriages. The remains of the latter at the fort are the only known examples. The counterweights for these "disappeared" for years. When they were re-discovered, on the docks in the city of Hamilton, they were promptly returned. Wander around, peer through its moat through cannon embrasure in the massive stone walls. Stand on its ramparts for views of the Atlantic on one side and the Great Sound on the other. See Fort St. Catherine and St. David's Lighthouse in far off St. George's Parish - and places you might otherwise miss. Follow the fort's eastern moat all the way down to the Great Sound to fish, swim, or just see the sights. On the South Shore, via Whale Bay Road, off the Middle Road, this is a most attractive public beach, battery (fortification), park and sightseeing area. The beach itself is small and pink. It is beneath the old battery on the hill. The area is so named for two connections with whales. From here, it is not uncommon in the spring months to see whales still migrating along their ancient routes off the South Shore. Also, at one point, the area was a staging point for boats that went out to catch whales. 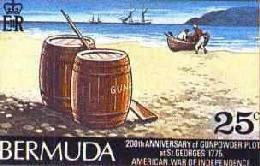 Whale oil and other products were staples of Bermudians for over 200 years. At one time, it was Bermuda's leading industry. Cliff side pathways in the park provide a gorgeous panoramic view of the mission of the gunners who once manned the battery. It was to defend the entrance to Hog Fish Channel, or Cut, the sea lane through Bermuda's reefs, located off the Pompano Beach Club area nearby. This channel could have provided an enemy with a way to penetrate the mainland and mount a commando style raid on the Royal Naval Dockyard. During an unsettled time in Bermuda's history, the 4.5 inch guns were trained on targets up to six miles out to sea beyond the beach. The barracks and ammunition magazine still exist. Much earlier yet, there was a fort located here. The original 17th century version is almost completely buried in the sand below the current battery.